Laura Shepherd-Robinson, author of historical thriller Blood & Sugar, delves into the often-untold history of slavery in Britain. Laura Shepherd-Robinson’s debut novel is a thrilling murder mystery set in Deptford in 1781, at the heart of Britain’s slave trade. Here she explores the history of slavery in Britain and its role within the transatlantic slave trade, the consequences that still surround us today and slavery in modern society. My debut crime novel, Blood & Sugar, is set in Deptford in 1781. Now a part of London, Deptford was then a port five miles downriver from the city and one of its key industries was the Atlantic slave trade. Like most people, I first learned about the slave trade in school. We were taught about the ‘triangle’ geography of the trade: how ships were dispatched from Britain packed with goods to exchange for slaves on the West African coast, then sailed to the New World where the slaves were exchanged for sugar, tobacco and other plantation crops, which were then sold at vast profits in Britain. The horror of the ‘Middle Passage’ of slaves across the Atlantic was touched upon in my lessons – who can forget the horrific image of the slave ship, ‘Brookes’, packed with bodies? But Britain’s role in slavery was considered firmly through the prism of William Wilberforce and slavery’s abolition, which was presented as a great stride forward for modernity and enlightenment. Our active participation in the slave trade for nearly three centuries remains an uncomfortable subject, too little understood. 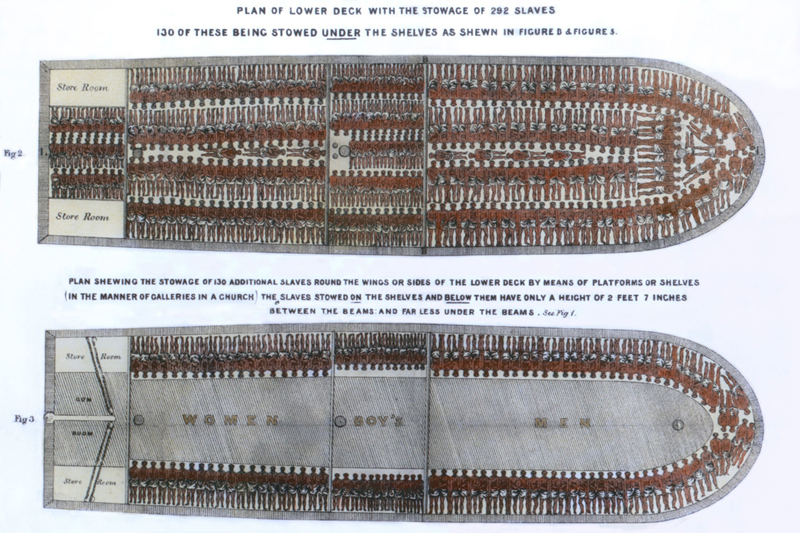 Illustration of the Brookes slave ship. Growing up in my hometown of Bristol, the fruits of that trade were all around me: beautiful Georgian mansions built on the profits of the slave trade, philanthropic buildings donated by the city’s wealthiest slave merchants, even in street names such as ‘Blackboy Hill’. Bristol, like many slaving cities, is starting to take a closer look at its history, with ongoing debates about statues and buildings commemorating slave traders. These are welcome steps in acknowledging that slavery didn’t just happen on the other side of the world, it happened here. Terrible crimes against humanity were conceived in British drawing rooms; black slaves were forced to work as servants in British households, often beaten and abused; and when the legal system grudgingly conceded that slavery was incompatible with Magna Carta, black slaves were kidnapped from British shores and covertly returned to their masters’ Caribbean plantations. In my fictional account of these times, I sought to depict slavery as it was understood then: a perfectly respectable trade, invested in by the kingdom’s wealthiest men, lauded by all except a few religious and political extremists. Slavery, alongside the sugar and tobacco trades, brought in vast revenues to the British state, as well as creating many dependant industries: the builders of the giant ocean-going ‘Guineamen’, the makers of chains and collars, professional companies providing slave ship insurance and legal contracts, and the manufacturers of the goods exchanged for slaves on the African coast. As such, it had a large contingent of defenders in Parliament: the formidable West India lobby – which fought a bitter rear-guard action to prevent abolition. The brutality of slavery was no great secret, but it was easy for the British public to ignore – especially when the supply of cheap sugar, rum and tobacco were at stake. The great achievement of the abolitionists was in turning the tide of public opinion by publicising slavery’s horrors, and making it impossible for people to look away. In my attempt to explore our slaving history in the context of a murder mystery, I read widely around the subject, gaining a closer understanding of the slave trade in general, as well as the real-life slave ship massacre which inspired Blood & Sugar. Another inspiration was the stories of 18th century black Londoners – some of whom lived as slaves, others as free men and women – and the role they played in abolition. I also paid several visits to the Museum of London Docklands, which has a fascinating and disturbing exhibition exploring London’s role in the slave trade. We can never think of slavery as something that belongs in a museum, a product of a more barbaric age. The Atlantic slave trade was a uniquely horrific industry and should be understood as such, but you do not have to look far to find contemporary examples of exploitation. Whether it is modern day slavery on British soil – in farms, brothels and nail bars – or our enjoyment of consumer goods built in factories abroad by workers enduring horrendous conditions, Georgian Britain holds no monopoly on hypocrisy. And the consequences of the African slave trade are alive today – they are felt every day in communities on all sides of the Atlantic. I hope Blood & Sugar contributes to the growing debate upon this topic and helps to promote a wider understanding of this shameful episode of our history and its enduring ramifications. In this episode of Book Break, Emma talks to Laura about the history behind Blood and Sugar, and explores more of the dark history of East London. 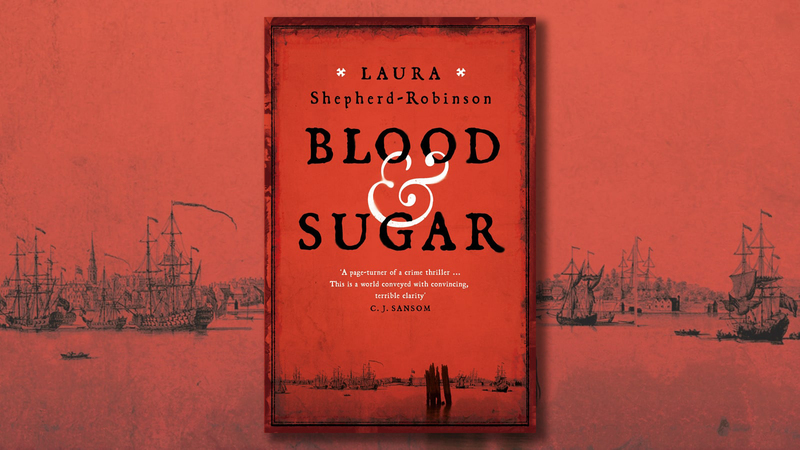 Blood & Sugar is a gripping historical crime novel from Laura Shepherd-Robinson. In June 1781 an unidentified and mutilated body is found hanging at Deptford Dock, branded with a slaver’s mark. When Captain Harry Corsham is asked to investigate the disappearance of old friend and committed abolitionist Tad Archer he is drawn into the dangerous world of Britain’s slaving industry.